--Biography by Fr. Mikhail E. Mikhail of St. Mark's Church of Cleveland, Ohio. Bringing up children in a Christian environment and instilling Christian values is the most important duty of parents and servants alike. This book tells about the characteristics of children in two stages: early childhood and late childhood. In order to relate to children, one must know their mentality. This book addresses, in the context of theological dialogue, some points of dissimilarity between the Coptic Orthodox Church and our Protestant brethren, namely Baptism, Tradition, Intercession, Venerating the Holy Virgin, her perpetual virginity, Fasting and more. The life of ministry, of serving God, begins with discipleship. And the deeper the individual goes in his discipleship, the more successful and effective is his ministry. Blessed is he who lives as a disciple throughout his life, learning every day. This book is a concentrated research on the divinity of our Lord Jesus Christ using verses from the Holy Bible. This book can be a reply to Jehovahs Witnesses and Sabbatherians concerning this point in particular. This book does not present you with a single subject, but with a collection of various separate experiences, ideas, and situations. It gives pictures from lifepractical pictures. Each picture gives a particular lesson or bears a certain meaning. This book is the fruit of more that 15 lectures delivered in St. Marks Cathedral in Cairo. They were published upon the request of Middle East Church Council on the occasion of a meeting held on "faith" in mid-September 1984. This book is not research into fasting from the viewpoint of doctrine and theology but a presentation of fasting in its spirituality which is the relationship between the one who fasts and God and how one develops and deepens it through fasting. This book is the second in a collection specially designed for meetings and classes for those engaged in ministry or preparing for ministry. The holy Church's concern over the story of Jonah the Prophet with the Ninevites has surpassed her concern for many other Biblical stories. She designated for it a feast, preceded by a three-day fast for the whole congregation in strict asceticism in order to guide us to repent as the people of Nineveh did. The story of Jonah is more than a prophet being swalled by a large fish. This book will help bring to life the spiritual significance and depth of the story of Jonah the Prophet. Previously presented was Psalm "19 and 20" "The Lord hear thee in the day of trouble" in one book. It is the first psalm of the third hour prayer. 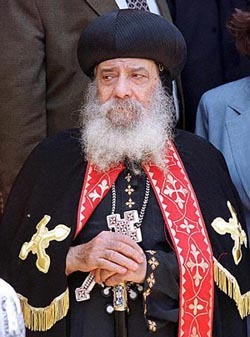 Here Pope Shenouda III offers you another book about a psalm of the morning prayer. Almost all of this book is a rejection of the erroneous understanding of the verse in the Bible which says: To Him who loves us and...Has made us to be a kingdom and priests...(Rev. 1:16), which the Brotherhood say means either: that we are all priests or, that there is only one priest, who is Christ. In this book, however, you will read: 1) A defense of the Old Testament. 2) A thorough examination of the sacrament of the Eucharist. 3) A study o the authority to lose and bind 4) A reply to many other objections, including the incorrect interpretations of various verses, such as, Do not call anyone on earth father, Nor are you to be called teacher and ..You are not to be called Rabbi, for you have only one Master and you are all brothers (Matt 23:8-10) 5) The duties of the priesthood and its titles and authority. What is to be released from the spirit ? The answer is that the spirit, while on earth, strives to be released from many things which this book will tell you about.. However, there is something else on earth which I think the spirit cannot be released from however it tries! Repentance is not a stage through which we pass through, then finish from. But it is life. It is a daily work that we practice everyday, since we sin everyday and are in need of repentance. This is the first book by Pope Shenouda III published about the Resurrection. It is the outcome of many lectures and sermons delivered on this topic. The book consists of three important elements: 1. A general view of the Resurrection, how it is necessary, possible and useful; and its spiritual and general effect. 2. Various articles on the Resurrection of the Lord Jesus Christ including events, its power and joy, and proofs and confirmation about authenticity. 3. The third part challenges the reader by asking 5 important questions. We hope that you may experience the effectiveness of the Resurrection in your life. The most dangerous thing about sin is that it means a separation from God; being cut off from Him in ones heart, in ones love, in ones will and in ones activity. It is to be parted from Him on earth and in heaven. How can we return back to Him? 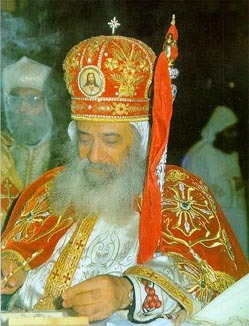 Included here are 16 lectures delivered by H.H Pope Shenouda the III on the Sermon on the Mount. They include the nine beatitudes and the words of our Lord. The Sermon on the Mount is indeed the constitution of Christianity. It is worthy of more meditation by you and while reading these and other contemplations you may be encouraged to learn it by heart. In this book are presented to young people in particular the Christian perspective on ten concepts including: the Concept of Power, the Concept of Freedom, the Concept of Rest & Fatigue, the Concept of Ambition, the Concept of Sin, the Concept of Love & Friendship and more. What does the word thanksgiving truly mean? There are different levels of thanksgiving, the reasons to be thankful and the virtues related to thanksgiving such as humility and patience. The Hymn of Thok Te Ti Ghom or "Thine is the Power and the Glory..." is chanted thoughout the entire Holy Week. Indeed, Lord, Thine is the Power and the Glory and the Blessing and the Honor forever AmenYou, Lord, are the Only Mighty One who overcame the sin, the world and the devil You, Lord, demonstrated an amazing power throughout. Find out the spiritual significance of this hymn, taken from the book of Revelation and why it is chanted throughout the Holy week. An excellent book to read and meditate on during the Holy week and to help further understand what took place on the cross.